Captain Craig Martin, of recently refitted charter yacht QM of London, _shares his advice on how to make the most of a private cruise or luxury yacht charter in Croatia. 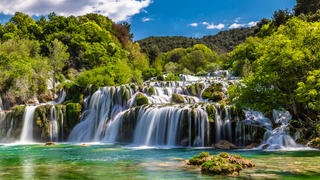 _ I like cruising Croatia because it is just so easy. Everywhere you go you can find a nice, quiet, isolated anchorage. If someone is in the spot that you wanted then you can drive round the corner and find your own place. I think it makes a great family destination because it offers a little bit to everyone. Most families seem to just want to bond together on the boat and do watersports and Croatia offers the perfect place to do that. Its waters are protected and clean and it has a little bit of what everyone wants. I like cruising Croatia because it is just so easy. Everywhere you go you can find a nice, quiet, isolated anchorage. If someone is in the spot that you wanted then you can drive round the corner and find your own place. I think it makes a great family destination because it offers a little bit to everyone. Most families seem to just want to bond together on the boat and do watersports and Croatia offers the perfect place to do that. Its waters are protected and clean and it has a little bit of what everyone wants. Everyone goes to Hvar and Dubrovnik, and they are great, but there are plenty of other places to be explored. If you go a little bit further up the coast then you have got the archipelago where there are thousands of islands and beautiful bays. I really like Šipan and Vis and they both have some really nice little secluded hideaways. 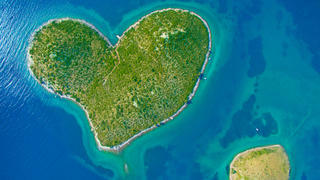 Croatia has enough space to make sure you have that exclusivity and privacy for anchorage. 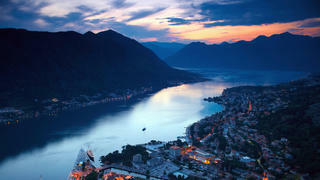 I generally like to pick guests up from Montenegro, either at Kotor or Tivat, because of the VAT issue. 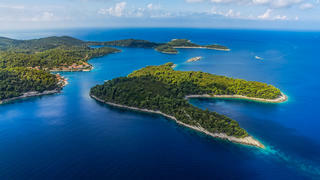 They are both relatively close to the airport and then its just a 48 nautical mile drive up to the marina in Dubrovnik. Most of the time we make the journey as a sunset cruise because there are beautiful views all the way up that coast. Guests can have cocktails and dinner, it is absolutely epic and doesn’t impact on any of their trip. We have clients who have the “no plan” plan and we have clients who like a very structured itinerary. Generally we find even those that like to have planned ahead tend to break it when they get there and find a place they like. One of the beauties of QM of London is that we are very flexible as we are here to give the guests what they want. If guests want two days in one place we stay there, if they go somewhere for an hour and they say “lets move down the line” then we move down the line. At the end of the day it’s about the guests and making sure they have the best experience. We have clients who have the “no plan” plan and we have clients who like a very structured itinerary. Generally we find even those that like to have planned ahead tend to break it when they get there and find a place they like. One of the beauties of QM of London is that we are very flexible as we are here to give the guests what they want. If guests want two days in one place we stay there, if they go somewhere for an hour and they say “lets move down the line” then we move down the line. At the end of the day it’s about the guests and making sure they have the best experience. It’s a bit of cliché but I always recommend the Krka Waterfalls as they never fail to wow people. You are not allowed to take your tender in so we arrange a tour and guests are accompanied by a stewardess, who will do the service, and one of the watersports guys to make sure things are done safely. The Buza bars set high up in the cliffs in Dubrovnik are also great. People dive off the cliff and you can watch the sun go down and have a bit of fun. There are now two cliff bars, the original one is a bit more laid back and has a sort of Caribbean style with plastic glasses and beer. The other place is a little bit more upmarket with cocktails and proper glasses.